Thanks to all who entered… Suzanne D. is the winner of this giveaway! Stay tuned for more giveaways to come! Today we’re having a cozy, stay-inside-with-a-mug-of-hot-chocolate, snow day in Texas. I’ve been working on putting together a “My Favorite Things” Giveaway and I decided that today was the perfect day to launch it! 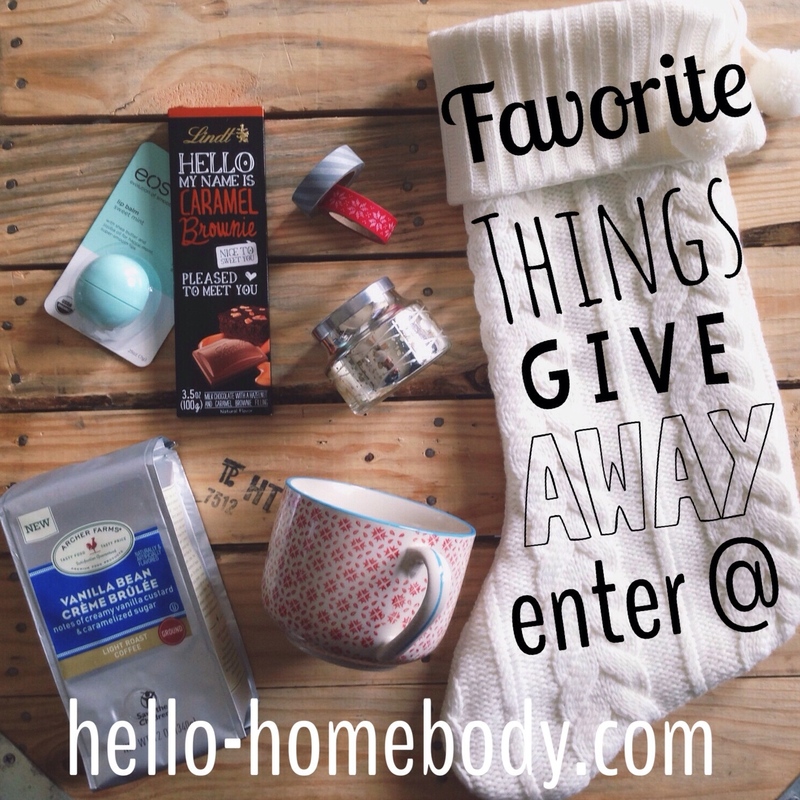 I’ve gathered some of my favorite treats for this holiday giveaway. 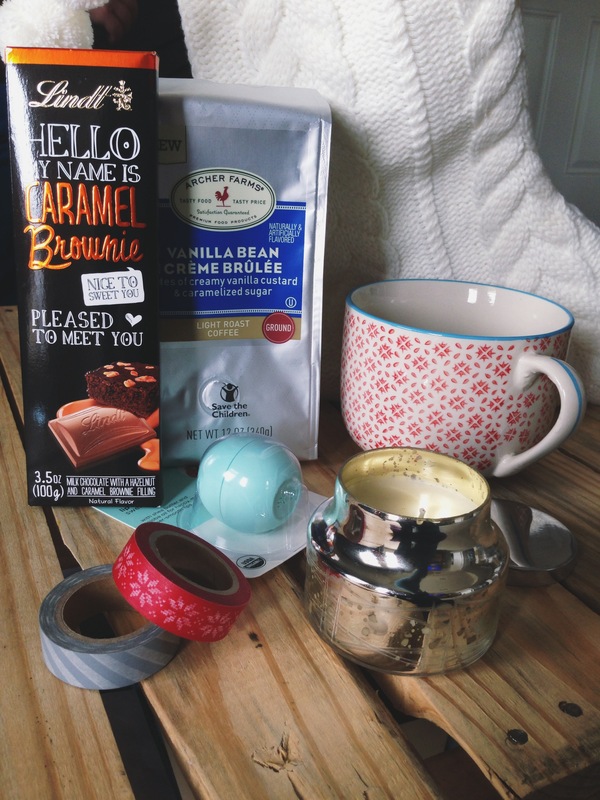 Enter for a chance to win these goodies for yourself or for someone you love! Let me know what your favorite holiday food or tradition is in the blog’s comment section below! Entries will be accepted until Thursday, December 12th, at 11:59pm. Winner will be decided by random.org and contacted soon after giveaway ends. Giveaway is open to all residents of the U.S. I love making hot spiced cider! It is perfect for the holiday get togethers with family and friends! It leaves your house smelling like the holidays! My favorite holiday food is Peanut Butter Fudge, but I try to stay away from it if I can. Our family Christmas tradition is to open one gift starting with the youngest person in the family, and for each person to open only one gift in turn. This way everyone gets to see what each person got. My favorite holiday foods are : broccoli rice casserole, and red velvet pound cake!! Putting the ornaments on the tree that we have collected over our 33 years of marriage – all have a memory connected to them. Also, we never had children, but every dog has had her own ornament and stocking! My favorite tradition was always baking tons of cookies with my mom and grandma! This is the first year without my grandma though. :( But I know my mom and I will still have a great (if not bittersweet) time! My favorite tradition is sugar cookies with frosting and sprinkles, watching the parade on tv and spending time with family. As I live in Sweden, I can’t enter… but love the things anyway! And my fave foods are cookies & roast veggies! my favorite holiday food would have to be snickerdoodle cookies. they don’t seem to be the same any other time of year. Like you on FB – my favorite holiday food is a new one that I made for the first time this year – pumpkin cheesecake bars with salted caramel swirl and a graham cracker crust. My favorite tradition and memory is putting up the tree with my family and looking at all the ornaments we were given or made as kids. It was such a fun time with the family, and we usually listened to Christmas music and ate homemade cookies and hot cocoa while we decorated the tree. Now that I’m married, I have started this same tradition with my husband as well with our own tree! My favorite tradition is making cookies with family (uncles, sisters, dad, mom, grandma, and even grandpa). We have done this for 25 years and I always look forward to this time of year to spend time with special people. My favorite holiday food comes from a recipe for chocolate chip cookies handed down to my from my mother. They are loaded with chocolate chips and walnuts and are a bit saltier than your usual cookie. We love making homemade gingerbread and sugar cookies on Christmas Eve. I always spend one entire weekend baking everything from fudge, to cookies to muffins and make care packages for my coworkers and my boyfriends office. It’s one of my favorite things to do because who couldn’t use a sweet treat to break up the day?! This is my favorite time of year!! You can get so caught up with everything during the year and be so busy. These last days of the year allow people to be with family. My family always waits for Christmas morning to open anything and have a traditional southern breakfast!! And then later we always find a movie to go watch!! Awesome assortment. I LOVE that stocking. My favorite tradition is gathering around on Christmas morning, after our stockings but before opening gifts and eating my mom’s family’s Christmas Stollen. My mom makes it every year, and I look forward to it for the other 364 days of the year. Every year we buy new Hallmark ornaments for the tree so we have a big collection now! I love all the holiday baking. *Shared on Facebook and on Instagram! Does that count as more entries? The winner has been determined and notified, and I’ve just updated the post. Thanks for participating and sharing this giveaway!